Clique aqui para receber notificações sobre novos giveaways no seu navegador. Não perca todos os incríveis giveaways. Permita as notificações no seu navegador. Todos os dias oferecemos software com licenças GRATUITAS que do contrário você teria que comprar! Remove as imperfeições de fotos digitais. oMega Commander é um moderno gestor de ficheiros. Se você não é um fotógrafo profissional (ou mesmo se você estiver), nem sempre é possível ter uma imagem limpa. Pessoas ou objetos indesejados são as coisas que podem estragar um bom tiro, mas não apresse-se e elimine-a. SoftOrbits Foto Retoucher é também projetado para trabalhar com outras tarefas: remoção de imperfeições da pele, a limpeza de grão de filme e digital de ruído, remoção de arranhões e manchas, reconstrução de imagens danificadas, etc. Comprar uma licença pessoal Ilimitada (com suporte e atualizações) com 70% de desconto! Esboço de Gaveta é um tipo de software de edição de fotos ferramenta para conversão de fotografias em desenhos a lápis de carvão. Este programa permite que os usuários façam o habitual fotografias em requintado lápis de imagens desenhadas, em preto-e-branco e colorido. Ao criar um desenho, você pode escolher o seu preferido mais configurações e opções. Há duas maneiras que você pode editar fotos com o SoftOrbits: manualmente e com o auxílio de pré-configurações. Estas predefinições podem ser utilizadas como um guia para iniciantes. Comprar uma licença PRO com 70% de desconto. 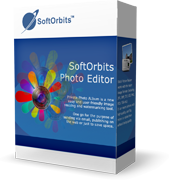 SoftOrbits Editor de Fotos que vai arrumar suas imagens para ajudar você a selecionar e remover objetos indesejados, ixing blur, a vibração da câmara e o ruído, substituir o fundo, melhorar suas fotos automaticamente ou sob a sua supervisão, aguçar os detalhes, nivelamento horizonte e enquadrar a imagem apenas para a direita. 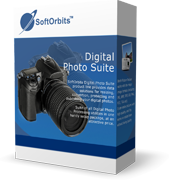 SoftOrbits Digital Photo Suite linha de produtos oferece soluções de dados para o retoque, o redimensionamento, conversão, de proteção e de publicação de suas fotos digitais. Comprar uma licença pessoal com 70% de desconto. The last time a version of this software was offered, not a single review appeared in the comment thread. Just complaints about the developer's alleged de-activation practices. Here, then, is a review of this latest version, as tested today. Downloaded and installed without a problem. Executable checked with VirusTotal. Result: 100% clean. Process slightly elongated as the activation code has to be obtained during the installation process itself. User is also required to provide an email address and name, but as the code immediately appears on-screen rather than being emailed, you might as well write anything in the boxes. Note that the install will also dump a shortcut to 'My Software deals' on your desktop. Delete it. Reference to the developer's website is always advisable when using image management software. SoftOrbits provides a gallery of before-and-after images, the first of which -- "Removing tourists from a photo" -- is blatantly misleading, seeing as how no software is psychic enough to know just what hidden visual information actually looks like. The 'after' shot view of the building at right, complete with the base of its blue-painted window surround, is faked. As the reliability of that example ruled out wasting time on any others in the developer's gallery, I instead selected a batch of different images from my archive representing different technical challenges on which to try PhotoRetoucher 5.0. Image 1: First test was of a close-up picture of an owl in its aviary. A total of 24 squares of wire mesh needed to be removed. The software did quite well here, considering that this was a speed job. It didn't deliver a 100% successful result but given the time I allocated to this exercise, it performed reasonably well. So far then, not too bad at all. Image 2: A too-dark sunset scene. I selected the Toolbar's quick-fix 'Image Correction' mode then enlarged the image as much as was feasible to re-examine the dark elements before proceeding. An irritating fault became instantly apparent: instead of the mouse icon resembling a traditional pointer, it carried on with the 'blob' shape for the removal process. There was no way of correcting this. The 'blob' obscured the very things I was trying to look at. Result: 100% fail. Image 3: The next test was of a landscape from which I wanted to clone out a dead tree. The top toolbar provides a range of tools, including a clone stamp. Result: 100% success. Image 4: Another image requiring removal of a visual element. However, although I selected the Toolbar "Remove" option, controls for which then appeared in the righthand Toolbox, no operation was possible because the software was still in cloning mode. It refused to proceed until I had defined a source point. All efforts to solve this problem proved fruitless. Result: 100% fail. Image 5: An old photograph, taken indoors and with too much noise. I used the Toolbar "Denoise" button. Again, the controls for this appeared at right but the surprisingly unchanged blob of the "Remove" option reappeared as the pointer when hovered over the image. As this was getting beyond tedious, I used the righthand Auto option to clean up the picture. The software then changed the image to total. . . black. Though this is certainly one way of getting rid of noise in an image by getting rid of the entire image, it's not a method I'd particularly recommend. Result: 100% fail. Image 6: Another landscape, another old photograph, from which I wished to remove scratches due to deterioration. I needed to maximize the image as much as possible so as to enlarge the scratches, and as that's impossible with the "Toolbox" showing at right, clicked on the close button for that panel to allow the image to occupy all the GUI screen estate. Only then did it become apparent that no means existed via which to restore the Toolbox. It had gone. And it wouldn't come back. A small downward arrow that may possibly have managed its opening and closing was non-functioning, and stayed that way throughout repeated attempts. The GUI was now effectively crippled. Result: 100% fail. The test was abandoned at that point as there's nothing to be gained in persisting with software whose functionality repeatedly fails due to programming glitches. Verdict: of all the image post-processing programs I've used in recent years, both freeware and paid-for, PhotoRetoucher 5.0 takes the award for Worst In Class. I really don't know what the developer thinks it is doing, publishing software which in my experience of it today doesn't actually seem to know what it is doing either. Uninstalled. The last time a version of this software was offered, not a single review appeared in the comment thread. Just complaints about the developer's alleged de-activation practices. Here, then, is a review of this latest version, as tested today. Downloaded and installed without a problem. Executable checked with VirusTotal. Result: 100% clean. Process slightly elongated as the activation code has to be obtained during the installation process itself. User is also required to provide an email address and name, but as the code immediately appears on-screen rather than being emailed, you might as well write anything in the boxes. Note that the install will also dump a shortcut to 'My Software deals' on your desktop. <b>Delete it.</b> Reference to the developer's website is always advisable when using image management software. SoftOrbits provides a gallery of before-and-after images, the first of which -- <i>"Removing tourists from a photo"</i> -- is blatantly misleading, seeing as how no software is psychic enough to know just what hidden visual information actually looks like. The 'after' shot view of the building at right, complete with the base of its blue-painted window surround, is faked. As the reliability of that example ruled out wasting time on any others in the developer's gallery, I instead selected a batch of different images from my archive representing different technical challenges on which to try PhotoRetoucher 5.0. The re-sizeable GUI is pleasant enough if slightly unusual in that there's only a righthand area allocated to manual controls (the Toolbox.) No controls are at left. This means the image butts up hard to the left, an arrangement that throws the GUI off-balance. The Toolbox occupies around a quarter of the screen estate; as long as it's there, it restricts the extent to which the working screen can be extended. The actual screen-top Toolbar provides 10 different options and 5 different tools, each of the latter with its own sub-set (they appear in that righthand Toolbox.) Image 1: First test was of a close-up picture of an owl in its aviary. A total of 24 squares of wire mesh needed to be removed. The software did quite well here, considering that this was a speed job. It didn't deliver a 100% successful result but given the time I allocated to this exercise, it performed reasonably well. So far then, not too bad at all. Image 2: A too-dark sunset scene. I selected the Toolbar's quick-fix 'Image Correction' mode then enlarged the image as much as was feasible to re-examine the dark elements before proceeding. An irritating fault became instantly apparent: instead of the mouse icon resembling a traditional pointer, it carried on with the 'blob' shape for the removal process. There was no way of correcting this. The 'blob' obscured the very things I was trying to look at. Result: 100% fail. Image 3: The next test was of a landscape from which I wanted to clone out a dead tree. The top toolbar provides a range of tools, including a clone stamp. Result: 100% success. Image 4: Another image requiring removal of a visual element. However, although I selected the Toolbar "Remove" option, controls for which then appeared in the righthand Toolbox, no operation was possible because the software was still in cloning mode. It refused to proceed until I had defined a source point. All efforts to solve this problem proved fruitless. Result: 100% fail. Image 5: An old photograph, taken indoors and with too much noise. I used the Toolbar "Denoise" button. Again, the controls for this appeared at right but the surprisingly unchanged blob of the "Remove" option reappeared as the pointer when hovered over the image. As this was getting beyond tedious, I used the righthand Auto option to clean up the picture. The software then changed the image to total. . . black. Though this is certainly one way of getting rid of noise in an image by getting rid of the entire image, it's not a method I'd particularly recommend. Result: 100% fail. Image 6: Another landscape, another old photograph, from which I wished to remove scratches due to deterioration. I needed to maximize the image as much as possible so as to enlarge the scratches, and as that's impossible with the "Toolbox" showing at right, clicked on the close button for that panel to allow the image to occupy all the GUI screen estate. Only then did it become apparent that no means existed via which to restore the Toolbox. It had gone. And it wouldn't come back. A small downward arrow that may possibly have managed its opening and closing was non-functioning, and stayed that way throughout repeated attempts. The GUI was now effectively crippled. Result: 100% fail. The test was abandoned at that point as there's nothing to be gained in persisting with software whose functionality repeatedly fails due to programming glitches. Verdict: of all the image post-processing programs I've used in recent years, both freeware and paid-for, PhotoRetoucher 5.0 takes the award for Worst In Class. I really don't know what the developer thinks it is doing, publishing software which in my experience of it today doesn't actually seem to know what it is doing either. Uninstalled. This is SoftOrbits. Please be aware that many MANY regular users of GOTD have found that their software mysteriously loses its registration when a new SoftOrbits package is installed. It's happened to me. I avoid this company and will do so until they give some sort of promise that they will stop this mean and deceptive trick. This is SoftOrbits. Please be aware that many MANY regular users of GOTD have found that their software mysteriously loses its registration when a new SoftOrbits package is installed. It's happened to me. I avoid this company and will do so until they give some sort of promise that they will stop this mean and deceptive trick. Fred, you are totally right. I am glad others mention that too, because I am bored to mention it every time another softorbit software is appearing here and they do appear often. It is just lost time and you will get angry when you open the software a couple of months later to find out it is unregistered trial. Fred, you are totally right. I am glad others mention that too, because I am bored to mention it every time another softorbit software is appearing here and they do appear often. It is just lost time and you will get angry when you open the software a couple of months later to find out it is unregistered trial. Downvoted every time. Fred, agree that SoftOrbits is a company to be avoided. Whether the problem with their Giveawayoftheday offers is due to a shortcoming of competence or integrity is a moot point as the end result is the same - an unhappy user. 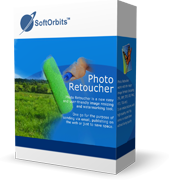 I installed Photo Retoucher and my other SoftOrbits giveaways (Sketch Drawer and Easy Photo Denoise) are still registered, licenses were not affected. I'm thinking this whole issue of licenses getting trashed when you install a different SoftOrbits giveaway, is a thing of the past. Has anyone had this problem in the past 6 months? I would seriously like it if SoftOrbits themselves would say something about this, one way or the other, but from my experience it's no longer a problem. © 2006 - 2019 giveawayoftheday.com. Todos os direitos reservados. Patente Pendente.